Could water in the Bull Run System and Columbia South Shore Well Field meet our region’s needs? 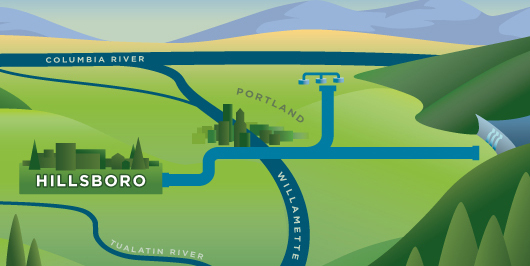 This project addresses that question along with the cost and feasibility of transporting water all the way across the metro region through Washington County to Hillsboro. This option would purchase water from the Portland Water Bureau (PWB) to meet future needs. Drinking water providers would then work with Clean Water Services to meet its future water needs from Hagg Lake. Currently, Tualatin Valley Water District, one of Hillsboro’s partners in the Joint Water Commission, purchases some of its water from PWB. As such, a transmission line from the Portland system exists to serve the needs of a portion of Washington County. However, a project of this magnitude would likely require increased transmission capacity. Between the Bull Run system and the Columbia South Shore Well Field there is sufficient water available for purchase to meet some portion of the future needs of Washington County. This drinking water source is unfiltered, currently serves over 800,000 Oregonians, and has proven to be very high in quality. While Bull Run water meets drinking water quality standards, the level of turbidity in the water from Bull Run may be of concern to Hillsboro manufacturing customers. Turbidity also causes seasonal aesthetic variations in the clarity and taste of the water. Purchase prices would have to be negotiated with the PWB, and would likely be based on the wholesale agreements Portland currently has in place with other water customers. The Study is further developing these cost estimates and results are expected in the fall of 2011. PWB currently provides unfiltered water from the Bull Run system and groundwater from the Columbia South Shore Well Field to its customers. The Environmental Protection Agency (EPA) has required PWB to either increase water treatment of the Bull Run system or to demonstrate that additional treatment is not necessary, due to the nature of the Bull Run source. PWB is currently pursuing parallel compliance paths with the new EPA requriement. It anticipates applying for a treatment variance this spring and hearing back from the State of Oregon and EPA regarding that request by the end of the year. If the treatment variance request is rejected, PWB is planning to install an ultraviolet treatment system at the Bull Run headworks. Currently, PWB is operating under an ordinance that would not allow any other entity to acquire an ownership interest in any part of the Portland water system without City Council approval. PWB stores a significant amount of water in its system of Bull Run Reservoirs. Additional source water storage would not be needed. Treated water would continue to be stored throughout the Portland and JWC distribution systems in agency-owned reservoirs. Some of the purchased water would also be injected and stored in aquifers during the winter. The water would then be recovered and used during the summer. PWB currently has statutory water rights to the Bull Run water source and state-issued water rights in the Columbia South Shore Well Field. Most likely, land would not have to be acquired under this option, although easements might need to be acquired for construction of an additional pipeline.